Came across this post today - GeoData Visualization vs. Analysis - and thought it would be fun to try in Geoquery. 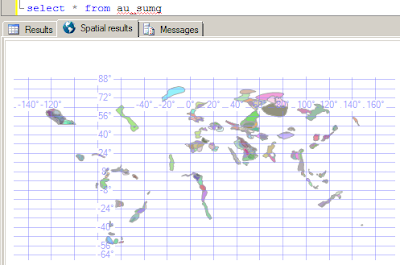 The dataset (au_sumg.e00) can be found at USGS and imported into SQL Server 2008 using Shape2Sql (by Morten). Among other statistics it contains data on known oil reserves (outside the USA, as of 2000). Management Studio's Dundas graphic sure looks nice - but a little difficult to interpret in isolation. Geoquery's Shape tab looks worse without even the funky pastel colors. However, the Map tab in Geoquery starts to make up for the green-ness by giving the shapes some context.